I recently heard that many fund managers earn an “incentive fee”, otherwise known as a “performance fee”, which is calculated based on the increase in the funds Net Asset Value – including both realized and unrealized fees. This is different from the typical “carry” at VCs, which is only seen when the asset liquidates. What this means for VCs is that the fund managers at LPs they have raised from, and are likely fundraising from again (because VCs raise every 3-4 years), see money in their bank accounts when the VCs portfolio companies gets follow-on capital, at a higher valuation. Simply put, that means is that it’s easier for VCs to raise money for subsequent funds when their portfolio companies are continuing to raise money at larger valuations. What this also means is that it’s harder for VCs to raise money for subsequent funds when their portfolio companies don’t raise follow-on funding, even if they are growing steadily in both revenue and profit. What this means for startups is that a VC, in general, will be more likely to invest in you if you tell them you plan on raising again – regardless of whether that’s the right plan. Also that founders can expect VCs to pressure them to raise capital. Just another example of what seems like misaligned incentives in the value-chain, which can lead to sub-optimal decision making for founders. 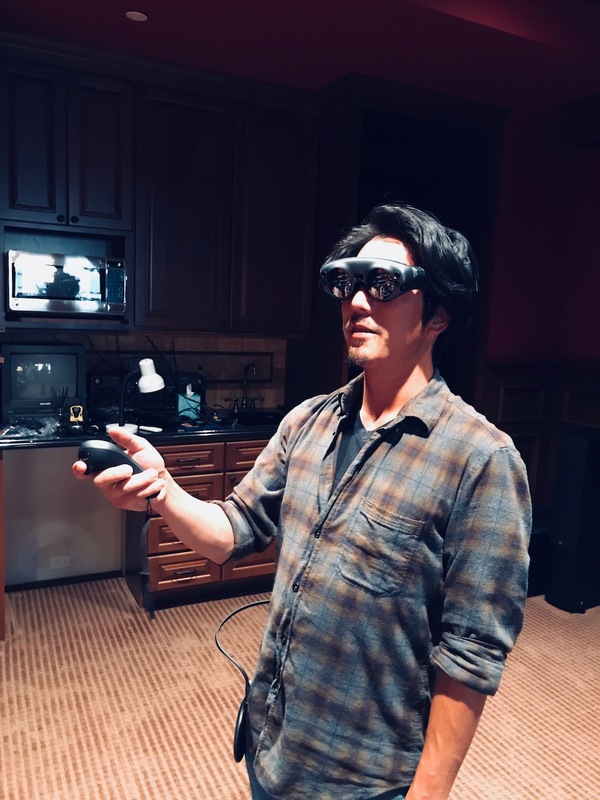 I had a chance to try Magic Leap last night. I’d read various reviews that the Magic Leap didn’t live up to the hype, so my expectations were low. I was pleasantly surprised with the experience. I haven’t tried other AR headsets so I can’t compare, but here are some thoughts. When you first put the headset on, it asks you to scan the room by following an arrow and stopping at targets. It gets you to really look around the room, up, down, left, right, diagonal, and so on. As you scan the room, it creates a grid that shows you where it’s identified walls, floors, ceiling, furniture, etc. This itself was a pretty fun experience. I tried the “Create” app, which is supposedly the most compelling one available. It’s more of a demo that allows you to draw and drop objects into your environment, as opposed to a full fledged game – but it was lots of fun. I first drew a red tornado spiraling around me, walked over to another part of the room and drew a blue 3d fish. I then dropped a ball on a couch and saw it bounce around a bit before nestling into the corner. It really felt like the items were interactive with the environment I was in. It was fun to hand the goggle to others and have them see what you’d drawn. The field of view is something that had been mentioned by others, and yes, it is small. That being said, I felt like the “screen” covered most of the available field of view, which I think is better than the “screen” being smaller than the lens – if that makes sense. Rather than objects disappearing off the “screen”, they disappear off the lens, which is a more natural experience. The lens felt dark. While you could definitely see your environment, it kind of felt like I was wearing shaded snowboard goggles. The scanning was pretty accurate. It was up to about one inch off, which wasn’t noticeable until I tried to “trace” the couch. Didn’t notice this when I was dropping objects on it. I could have played with this one app for hours, probably getting lost drawing some crazy environment. IMPO, the technology is there. Now we need some creative geniuses to come up with “killer” use cases and games that everyone would want to play while looking silly wearing glasses like this. The effect of new technologies are difficult to understand. I think we’re still learning a lot about how social media influences the world today, which is an extension of how the internet affects us – both of which might not seem that new to us. Today, some of the newest topics we’re discussing are blockchain, artificial intelligence, and robotics. We as a society agonize over the impact of these technologies. When trying to understand something new, it’s a good exercise to think of ways that it’s not new – specifically, look for something that’s been around for a while with lots of parallels. – Both tie government issued currency to the value of something not (directly) controlled by one government. – Both are only as valuable as we consider it to be. – Both have a limited supply. – Both can be “mined” by those with enough of the appropriate resources and know-how. Based on this exercise, what are some theories we can come up with on the effect of Bitcoin? – It won’t replace government issued currency. – It will continue to have value that fluctuates. Looking at the differences, for example one being digital while the other is not, we can already see today how Bitcoin could be accepted as currency at most merchants while Gold cannot (or at least not easily). This may or may not affect our previous theories. What do you think and why? All of the above is clearly oversimplification, but I present this method merely as a thought exercise. Author YoheiPosted on February 27, 2018 Categories MusingsLeave a comment on An exercise in understanding the impact of new technologies. In 2017 alone, Bitcoin created massive value for early investors in it – billions of dollars. This made me think – did Bitcoin really create that much value for society? Where does this wealth come from? Can wealth be created? Or is wealth a zero sum game? My gut says it is. I leaned on my trusted friend, the internet, and found some good arguments for why wealth is not a zero sum game, that wealth grows – but I found this leaned on two basic premises, that wealth is perceived, not material, and can only be acquired by humans. Let’s talk about perception first. One argument for wealth creation goes like this. I have two eggs and you have two apples. We’re likely to trade because I value one apple (which I don’t have any of) more than one egg (which I have two of), and vice versa. Argument goes that wealth is created through this trade on both ends. Another argument goes like this. If I paint a beautiful painting, you’re likely to pay more for it than if I were to simply sell you the paint and canvas. Thus, I must be creating wealth through my skills. In both cases, there is no increase in material wealth. In the first case, we start with and are left with two apples and two eggs. In the second case, we start with and are left with paint and a canvas. That being said, there’s no question that perceived wealth does increase. Now let’s talk about wealth only being acquired by humans. One argument for wealth creation goes like this. If I walk into a park and find a beautiful rock, pick it up, and take it home, I’ve created wealth. While if you look at me alone, or human society as a whole, I’ve indeed created wealth, but the idea that I’ve actually created wealth assumes that the park cannot possess any. Another argument is a little more complicated, but goes like this. I’m a farmer, and I start using pesticides that increases the yield of my crop by 20%. This increases wealth as I’m able to feed more people with the same amount of work. I’m not going to pretend I can quantify the value of life to an individual insect, the value of the insect to a frog, or the total effect of pesticide creation on who knows what, but simply stating that I’m creating wealth through increased yield by using pesticides doesn’t sit well with me. My argument is that if you look at wealth as material, not perceived, and if wealth is not just acquired by humans but can be acquired but all entities, then wealth may very well be a zero sum game. Wealth, like mass, can neither be created nor destroyed – simply altered in form. The reality though, is that wealth is perceived. The value of an object, physical or digital, is the value we as society place on it. Perhaps, though, when we use words like wealth, we might consider it as something not only acquired by humans, but by all entities in the universe and the universe itself. This might encourage us to recycle more, eat organic food, and value (or at least consider) sustainable activities not often associated with wealth creation. I like to view the world through different “lenses” to help me understand it. It’s a means to generalize the world and help me consider patterns. Thinking of the world simply as a collection of matter and space is what I call the “physicist lens”, a collection of incentives is the “economist lens”, a collection of energy is the “spiritualist lens”, and so on. Today, I spent some time thinking of the world as a collection of data, which I’ll call the “data scientist lens”. Through this lens, I saw that human society is doing one big complicated data science project. It can be broken down into many smaller projects, but they’re intertwined as every piece of data can be connected to another through some series of nodes. The process of a data science experiment roughly goes like this: you collect and store data, you process it (clean, merge, etc. ), analyze the data, extract insight, create an action plan based on the insight, execute the action plan, reflect on the process, and repeat the process. Similarly, in society, we’re constantly going through this cycle. We do this as individuals daily, as groups of people (companies, families, social groups), and as a society at large. Like complex organisms, society becomes efficient by allowing smaller groups within to specialize, in the type of data it deals with and in the phase of the process. As a Venture Capitalist, our role is in the reflection phase of the process, specific to new data (social data, voice data, health data, etc.) and new processes (cloud storage, distributed ledgers, machine learning, etc.). We reflect on the past and allocate resources that human society has trusted in us to control – through a network of complicated financial institutions. As individuals, we have the desire to both serve ourselves and serve society at large. As Venture Capitalists, our job is to see what’s working to create value (desired change in data – wealth, health, and happiness) for individuals, both people and business, and for society at large. When approaching VCs, this is important to understand. You should do as much homework as possible before approaching any VC. Here are a couple things you should try to find out if possible. The first thing you should learn is what stage a VC invests in. Broadly, VCs invest in early, growth, or late stage. Specifically, they may invest only in Seed, Series A, Series B, and so on, but most will be interested in a couple of these. Most VC funds have a thesis. Some as broad as B2B vs B2C. Some invest in one or more specific industries, like SaaS, Finance, Smart Home, Automotive, and so on. Within an industry, they may have specific areas of interest. This thesis may be driven by what they see as opportunity (good markets to invest in), their areas of expertise, or their network. Often the VCs communicate this thesis to their LPs, so they may invest strictly within their thesis, while others may be more open. In addition to funds having a general thesis, each partner in a fund will usually have their own areas of interest. This is similar to stage, but worth noting separately. Many VCs have a range for a check size they’ll cut in a first investment (different from follow-on check size). They’ll probably have a general round size they’re interested in investing in. Combine these two, plus stage, and past investments, and they’ll get a sense of ownership %, which is also important to them. VCs usually know how frequently they plan on writing checks. Active ones may write multiple checks a month, while less active ones may write only a handful a year. This frequency can be cyclical, based on their own fundraising status and amount of capital left in their current fund. VCs vary in how they make investment decisions. At a fund with a single GP (often smaller funds), this is pretty straight forward. Most bigger funds have multiple partners, and this is where it starts to differentiate. Some funds need unanimous agreement amongst partners, some need majority, some might have a unique voting structure, and some only need one partner to want to invest. No matter the case, you’ll usually be working with one partner who is selling this investment internally. If you’re working with an associate or principal, it might be worth trying to understand how they fit into the process. Due diligence happens before decision making, and can vary by VC. It can include everything from multiple meetings, meeting you in person, having you meet the whole partner team in person, reference checks with references you provide, reference checks with references you don’t provide, checking in with expert colleagues, and a whole lot of other stuff (exit analysis, competitor analysis, market analysis, etc.). Quite simple, but some VCs will lead rounds (some prefer this), while others will only follow. The ones who lead rounds are setting terms, and the ones who follow will often look at who is leading the round as important data when making decisions. Some VCs are hands-off and don’t get too involved after investing in a company. Today, many VCs use their ability to support companies as their differentiator, earning them a seat in hot rounds. The ways in which VCs support their portfolio companies differ as well, from making introductions to emotional support to actually getting their hands dirty in some operational stuff. This one should be relatively easy to find out (hint: Crunchbase). You should be able to extract some general ideas about thesis, stage, and maybe even frequency through studying their past investments. It’s also worth noting that VCs tend to have a bias toward or against patterns they’ve noticed in their own investments (ie. “I was burned once by an investment in a company selling to SMBs so…”). VCs are like snowflakes, each one is unique. One of the harder data sets to track is food consumption, which can in theory provide some vague estimate count of nutrient, calorie, etc. over time. Once tracking this data becomes easier, we can start to correlate this against health outcomes. In both cases, the app will parse out your food input into ingredients, then nutrients. Both (I assume) will learn over time and get better at knowing what you eat. Bitesnap seems to have a more intuitive way to provide feedback. AngelList continues to disrupt the venture capital industry. Here’s how they are turning operators into venture capitalists. Survival rate and acquisition rate of startups based on fundraising round. Looking at exit values of companies founded previously by today’s top VCs. Percentile curve of total US startup funding. A list of partners from well known VCs who are launching their own funds. Looking at the trend of younger VCs. I’ve read a lot about love and hate these past few days, as if one is good and the other is bad. Love and hate, however, are two sides of the same coin. If you hate globalization, you probably love your country. If you love Hillary, you probably hate Trump. If you love love, you probably hate hate. Hate has a place in this world though. I hate intolerance, you probably won’t judge me for that. I hate unfairness. I also hate when people hate the people who hate the things they love, because that’s intolerance. We all have different backgrounds that lead us to love and hate different things. I have my opinions on what is good and bad. What I love is good and what I hate is bad. Are you any different? Is anyone any different? Stand for what you believe in. Lead by example. But don’t forget to be tolerant, especially of those who believe in different things than yourself. We first saw program trading, where computers were preprogrammed to execute a stock trade based on predetermined conditions, in the 1980s. Today, over 1/3 of stock trades worldwide and well over 1/2 of stock trades in the US are executed by algorithms. Algorithmic venture capital investing is far from common place today, and many argue it never will be. However, it would be hard to argue that data does not play an important role in the industry. Pioneers in this space already use algorithms to make decisions. Matt Oguz at Palo Alto Venture Science ($200M fund) looks at 13 different variables for each prospective company, like technology, IP, people/team, location, and competition (source). WR Hambrecht Ventures works closely with Thomas Thurton of Growth Science and combined predictive modeling with Clayton Christensen’s disruption theory (source). David Koatz and David Kienzle at Correlation Venture ($166M fund) weighs the track record of the entrepreneurs, investors, and advisors heavily (source). Google Ventures ($1.5B under management) looks at data from academic literature, past experience and due diligence of founders and startup. (source). Looking at survivorship of companies after a 10-year period, Thurston says his algorithm has a 66% hit rate, but it’s still too early to know if these algorithms can consistently out perform humans, and if so, in which areas. It would make sense that this algorithmic approach works better for later stage investing where there are more consistent and comparable metrics to feed into the algorithm, as opposed to early stage companies where there are fewer metrics to feed into the algorithm. Some might suggest that this algorithmic approach would work best for niche categories, allowing the algorithm to specialize. Circle Up a crowdfunding site for consumer packaged goods employs an algorithm to help help evaluate over 500 deals a month (source). Deep Knowledge Ventures appointed an algorithm to it’s board, capable of making investment recommendations of age-related disease drugs and regenerative medicine companies based on a companies’ financing, clinical trials, intellectual property, and past funding rounds (source). While these algorithms can process more information and deliver results quicker, most (if not all) funds still employ some human element to screen results before making final investment decisions (source). By making enough investments, it’s not difficult to see how an algorithm might help a fund outperform the average venture fund. It seems difficult, however, for an algorithm based fund to be a top-performing fund, whose returns come from outliers – which are by definition the most difficult to identify via an algorithm. Perhaps the role of algorithms in venture capital investing is not to replace human decision making, but merely augment it.